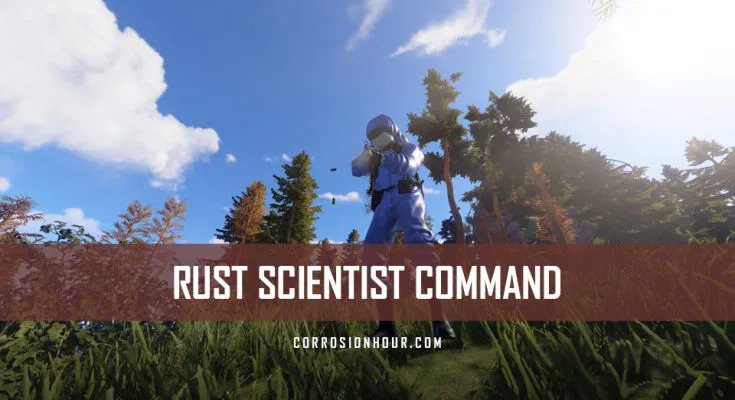 The RUST scientist command, introduced in Devblog 195, allows admins and moderators to spawn scientist NPCs into the game server. The scientist are controlled by an AI system that can be configured through server variables. In Devblog 194, player worn radiation suits had a full make over, to help differentiate players from the scientists NPCs, which wear a solid blue colored radiation suit and can be seen wielding numerous range and melee weapons. As of Devblog 198, scientist still inhabit the Military Tunnels monument, but are now also spawn at some vehicle junk piles. These scientist will behave a lot less aggressively than those found in the Military Tunnels. They’ve also been modified to now carry a Geiger counter by day and a flashlight by night. They’re also wielding a M92 if an engagement occurs. Server admins and moderators can still manually spawn scientist into the game world and a full list of variables controlling the scientist event and AI can be found below. The RUST scientist command and variables can be issued and configured on vanilla RUST servers by RUST admins and moderators only. 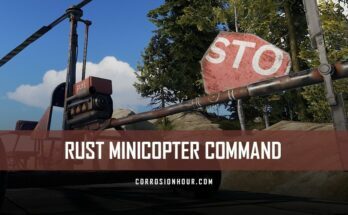 Non-admin players on vanilla RUST servers cannot use the RUST scientist command and variables. This command is used to manually spawn a scientist into the game, regardless if the RUST scientist have been enabled. This variable is used to enable and disable the RUST scientist NPCs on a RUST game server. This setting defaults to true. This configuration must be set up in the server start-up script in order for the scientists to populate the server. 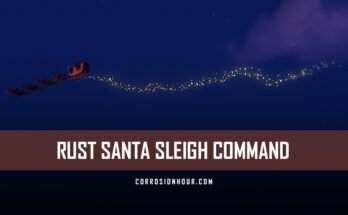 This event can impact the server’s overall performance if any of the settings are wildly configured. Keep sane defaults. Nav_Mesh setting must be enabled if you want the scientists to move/roam around the map. ai.npc_alertness_drain_rate 0.1 Defines the rate at which we drain the alertness level of an NPC when there are no enemies in sight. ai.npc_alertness_zero_detection_mod 0.5 Defines the threshold of visibility required to detect an enemy when alertness is zero. ai.npc_cover_compromised_cooldown 10 Defines how long a cover point is marked as compromised before it’s cleared again for selection. ai.npc_cover_use_path_distance True If npc_cover_use_path_distance is set to true then npcs will look at the distance between the cover point and their target using the path between the two, rather than the straight-line distance. ai.npc_door_trigger_size 1.5 Defines the size of the trigger box on doors that opens the door as npcs walk close to it. ai.npc_families_no_hurt True If npc_families_no_hurt is true, npcs of the same family won’t be able to hurt each other. ai.npc_max_junkpile_count 20 Defines how many npcs can spawn into the world at junk piles at the same time (does not include monuments). ai.npc_max_population_military_tunnels 3 Defines the size of the npc population at military tunnels. ai.npc_patrol_point_cooldown 5 Defines the cool down time on a patrol point until it’s available again. ai.npc_respawn_delay_max_military_tunnels 1920 Defines the maximum delay between spawn ticks at military tunnels. ai.npc_respawn_delay_min_military_tunnels 480 Defines the minimum delay between spawn ticks at military tunnels. ai.npc_spawn_per_tick_max_military_tunnels 1 Defines how many can maximum spawn at once at military tunnels. ai.npc_spawn_per_tick_min_military_tunnels 1 Defines how many will minimum spawn at once at military tunnels. ai.npc_speed_crouch_run 0.25 Defines the speed of an npc when in the crouched run state, and should be a number between 0 and 1.
ai.npc_speed_crouch_walk 0.1 Defines the speed of an npc when in the crouched walk state, and should be a number between 0 and 1.
ai.npc_speed_run 0.4 Defines the speed of an npc when in the run state, and should be a number between 0 and 1.
ai.npc_speed_sprint 1 Defines the speed of an npc when in the sprint state, and should be a number between 0 and 1.
ai.npc_speed_walk 0.18 Defines the speed of an npc when in the walk state, and should be a number between 0 and 1.
ai.npc_valid_aim_cone 0.8 Defines how close their aim needs to be on target in order to fire. ai.npc_junkpile_a_spawn_chance 0.0 Defines the chance for scientists to spawn at junkpile a.
ai.npc_junkpile_g_spawn_chance 0.0 Defines the chance for scientists to spawn at junkpile g.
Below are the item IDs used to spawn in the different Hazmat suits found in RUST. These item IDs can be used with inventory. give and entity.spawnitem commands and passing the specific Item ID. Below are the IDs used to spawn in the different junkpiles found in RUST. These objects can be spawned in the game using the spawn command and passing the specific Item ID.